ChessDiag is a utility to visualize, create, read and edit FEN lines. The main purpose of ChessDiag is the preparation of chess diagrams as HTML code for visualizing chess positions in web based chess fora. 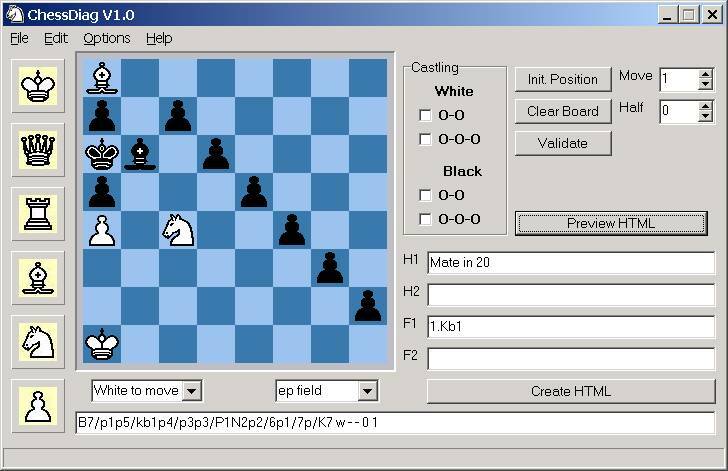 Either copy a FEN line via clipboard to ChessDiag or setup the position directly on the chessboard. Hint: The FEN line under the chessboard is a readonly textfield. So you can't enter a FEN line in this field. Shows the HTML based diagram in your local browser with the local pieces' copies (no network access needed). Copies the HTML code to the clipboard. Copy the image data as a bitmap to the clipboard.